esveidy is using Smore newsletters to spread the word online. 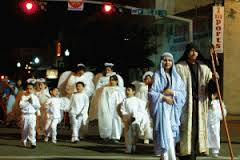 la posada is a celebration that begins on December 16, it is celebrated 9 days in counting with candle lighting and parties. This is a celebration that celebrates around Jesus birth . families gather around and re-enact the holy family of joseph and Mary's journey . Our traditional dishes for la posada are tamales , rice , chiles rellenos etc. 3 men carting gifts for baby Jesus. los tres reyes magos celebration is a celebration that portrays the journey to bethleham of 3 men carrying gifts for baby jesus. on january 6 children wake up to a special treat such as toys & gifts. a special treat served on this day called la rosca a crown shaped sweat bread with plastic hidden babys in the dough, for whoever gets a piece with a baby in side, is obligated to host a party on february 2 when mexico holiday season comes to an end .